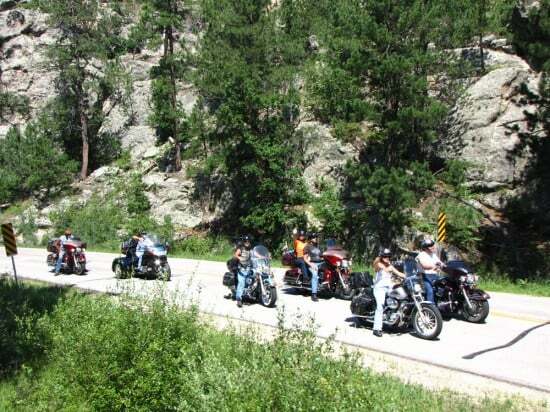 Motorcycles in Black Hills of South Dakota during the Sturgis Bike Week. Once you’ve visited the Black Hills of South Dakota the first time, you’ll probably put them on your must-visit-again list! With attractions and activities that span the four seasons, there’s always something new to do. What makes the Black Hills so popular with visitors? I’ll share 10 of our favorite places and things to do. Mount Rushmore in the South Dakota Black Hills. The term, of course, comes from the television hit, 3rd Rock from the Sun, and William Shatner as the Big Giant Head — one of my favorite shows from the end of the 1990s. These giant heads are carved in granite though, rather than being visiting alien dignitaries. 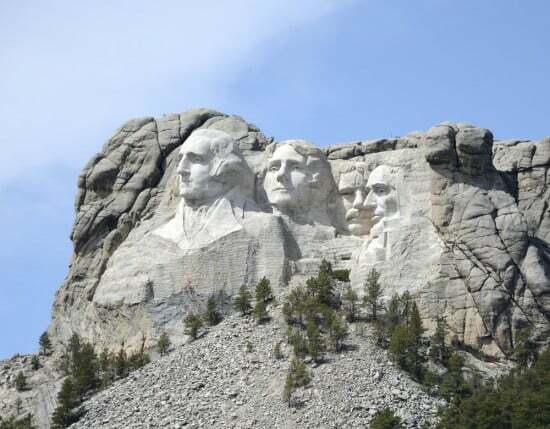 The heads represent the profiles of the US presidents: George Washington, Thomas Jefferson, Theodore Roosevelt, and Abraham Lincoln. 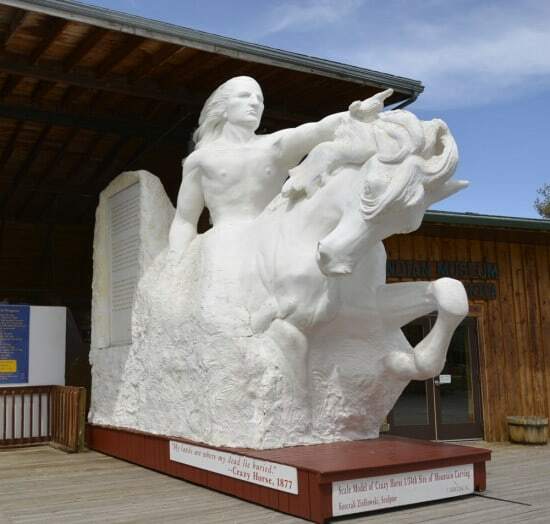 The Crazy Horse Memorial, unlike Mount Rushmore, is still in a state of production–and has been since the first blast in 1948. Bust of the Crazy Horse Memorial that was started in 1948 and is still under construction on the mountain side. Eventually the carving will consist of Crazy Horse and his galloping horse. The horse’s head, now being blocked out, is 22 stories high! Its ear alone is 45 feet long. Now that’s some horse. The statue can be viewed from the Indian Museum of North America, which is a nonprofit, educational and cultural project financed primarily from admission fees. We found the expansive museum held a lot of artifacts representing not just the culture of early Black Hills residents, but of peoples across the United States. While there’s still a lot of work to be done on curation with the artifacts, they’re an impressive collection. The museum also featured a lot of the tools and photos showing how both the Mount Rushmore and Crazy Horse statues were first blasted, then chiseled out of rock. We took the Black Hills Central Railroad train trip a few years ago–that time I got to see the back side of the “big giant heads” aka Mount Rushmore! The Black Hills Central Railroad arrived in the area after the discovery of gold in Custer in 1874 and the subsequent strikes in Deadwood and Lead. During the late 1890s and 1900, the tracks the 1880 Train runs on were built between Hill City and Keystone. Today, the vintage steam train chugs on wooden trestles over streams where you can still dream of finding that big gold nugget! Alice Cooper on stage at the Buffalo Chip in Sturgis, South Dakota. A little music goes a long way to providing great summertime entertainment–especially when it’s at one of the best outdoor venues we’ve attended. 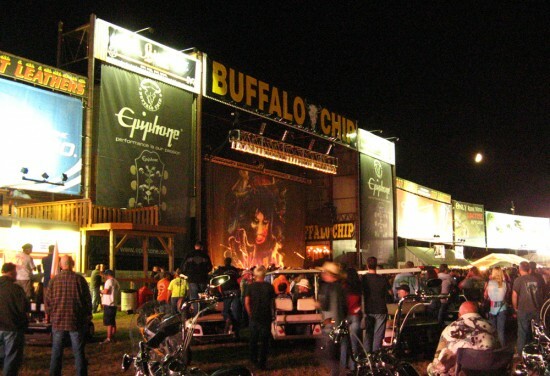 The Buffalo Chip started out back in 1981 as the place to be for campers during the Sturgis Bike Rally–and now, it’s the place to be for visitors looking for a great evening of entertainment. You can, of course, still camp at the Buffalo Chip too. In 2014, visitors got to celebrate the 15th anniversary of the Motorcycles in Art display in the Sturgis Buffalo Chip Exhibition Hall. Its theme was Built for Speed. As they say, “You haven’t seen nothin’ until you been at Bike Week.” And I can guarantee that the sound of all those motorcycles stays with you long after your visit. Motorcycles fill all of the towns and small cities during Bike Week. 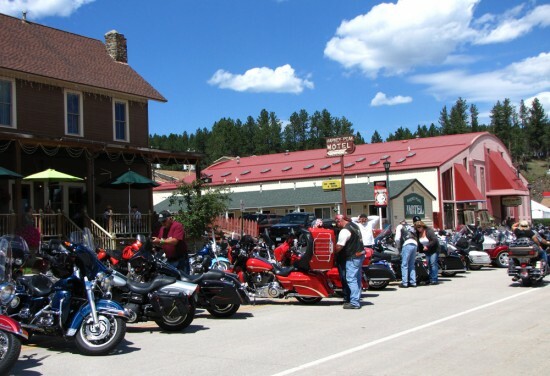 Driving through the Black Hills National Park and Custer State Park are enough to give you a good idea of why the Sturgis® Motorcycle Rally is one of the most talked-about motorcycle event of the season every year. Highways twist and turn through the Black Hills, making for a scenic pleasure cruise. While we always have a hard time getting used to seeing motorcyclists not wearing helmets, the feel of the wind through your hair and smell of fresh mountain air is clearly a draw for riders. There’s nothing can match the experience of being in the total darkness that’s only found underground in a cavern–while there are eight different underground caverns you can explore in the Black Hills, we chose the Black Hills Caverns. Come along for the tour! Lead, the mile-high city, was a mining down for decades–and today we can get insights into that part of American history with a lot of the architecture and attractions in this small, historic community. While our visit was too early in the year (Easter) for the mining tours, they’re available right opposite the Town Hall Inn, where we stayed. The tours consist of a 45-minute walk “underground” to mining level that showcases the changes in mining over the decades. The little museum attached to the Homestake Open Cut Gold Mine (also right across from the Town Hall Inn) was, however, open. Although it displayed a number of interesting artifacts, the most intriguing part of this free attraction was the open cut mine itself. Mined for more than a century, from 1886 to 1998, the chain-fenced open cut mine (viewing centers in the museum) consists of row after row of solid rock tiers cut into the earth. 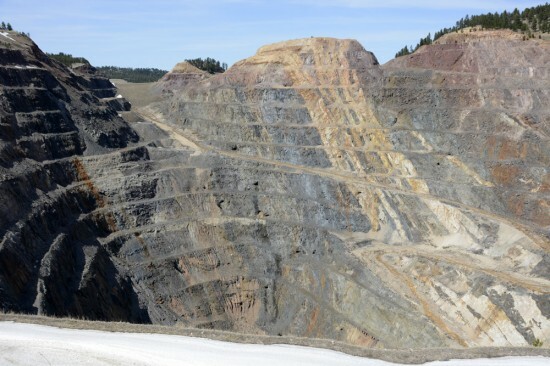 The Open Cut is 1200 feet deep into the earth and around 1/2 a mile wide, making an impressive pit mine. Since tourism is so important through the Black Hills, it’s a given that there are lots of different types of accommodations. I always like to find something just a little different if I’m staying for a few days though, so on our last trip I chose the Town Hall Inn situated on Main St. in Lead (pronounced as in to lead a horse). The historic Town Hall Inn, in Lead, South Dakota. While I often rely on sites like Expedia to book hotels, I found the more interesting accommodations I turned up browsing the Web weren’t listed with those types of online booking services. So, I made my reservation through Black Hills Vacations, where I had excellent service and no problems at all. On our arrival at the Inn, we were greeted by our hosts, Paul and Mark–they made us feel right at home, and were around all weekend to answer questions and make sure we were comfortable. The Inn itself was, as the name suggests, originally constructed as the City Hall. 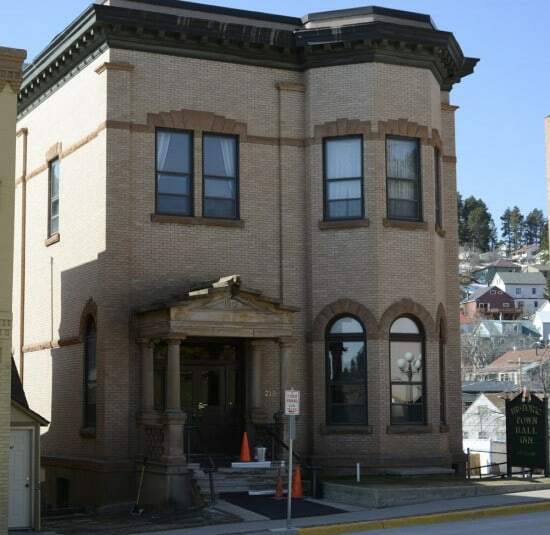 It served that purpose from 1913 until 1938, then was the General Office of the Homestake Mining Company from 1942 until the mid ’90s. Now, it’s an amazing boutique hotel with original woodwork, high ceilings (16+ feet), tall windows, and an impressive long-long staircase (note, if stairs aren’t your thing, make sure you reserve a main floor room). We booked a room with an ensuite bathroom, but not all rooms have that feature. And the sleep? While the bedframes are appropriate for the period, the mattress upgrades are definitely modern, and we found the beds very comfortable. Better yet, after a great sleep, breakfast, which was included with the room rental, included some home-made poppy seed pound cake. Delicious! Interior of the Bumpin Buffalo in Lead, South Dakota. The Bumpin Buffalo also has two nicely renovated rooms available on the upper level. 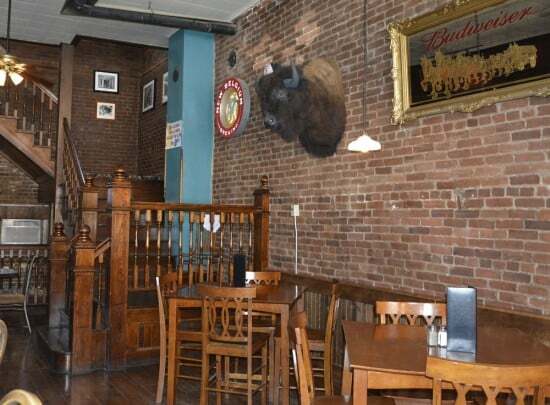 If bars and pubs with character are part of your vacation planning, Lead’s Bumpin Buffalo Restaurant/Saloon may become your favorite hangout, as it did for us, especially as it was right next door to the Town Hall Inn–no worrying about who had to drive after dinner! The building is one of Lead’s oldest, having been built in 1897. Today, it retains an authentic feel with its original brick walls and dark woodwork, along with a friendly atmosphere. We leaned back in the comfort of a spacious booth our first night for an excellent meal of prime rib, then pulled up bar stools the next afternoon for bowls of soup and corn nuggets (Kernel corn deep fried in a sweet batter–try some!). The drive through the Black Hills is beautiful, no matter what time of the year you visit, but the 22 mile drive along the Spearfish Canyon Scenic Byway is one of the most memorable. It was so long ago when I saw Mt. Rushmore that I am not sure if I have seen anything else here, although that gold mine looks really cool. The mines are always interesting, aren’t they? Those tiers were fascinating.